In other words, Annacone (a consensus follower IMHO) intended to make Federer follow the current fad of flat hitting power players—turning Federer into a mini-Robin Soderling, or a mini-Juan del Potro. Unfortunately Roger Federer is not that kind of player—nor does he need to be. Leave desperation power shots to the likes of Soderling and del Potro—all players who lack Federer’s control of the ball—players who cannot keep the ball in play long enough to create an opening. Federer’s aggressive style against Djokovic is what lost him the match at the US Open. Instead of moving Djokovic around and creating openings for winners, Federer tried for winners, when the conditions were not yet ripe. 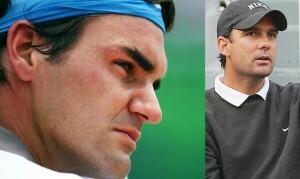 All Federer had to would be to move the tiring Djokovic around the court until the winning opportunity presented itself. Wham, bang, is not a winning strategy—and counter-productive for someone as talented as Federer. First round knockouts are rare in tennis (or any sport). You have to maneuver your opponent until you have a clear winner. Federer was even trying to hit half-volley winners off the baseline—which is as good as impossible. Roger—please save yourself—please fire Paul Annacone! I totally agree. When have we ever seen Federer get tired? Never. He should of just played Wilander tennis against Djokovic. All this power hitting will start to injury Roger. Fire Annacone. Look what he did to British tennis: nothing. So why would Federer hire this loser? Charles: And Djokovic, who tires easily, was exhausted in the fifth set, and easy pickings for Federer. Annacone was a chip and charge guy – exactly what no one needs in today’s tennis. Exactly! What does Paul Annacone know about passing guys at net? Especially nowadays! He has no idea about how guys these days are easily and routinely passing guys 15 feet behind the net. The angles players are hitting today are so varied too. Borg and Wilander were never hittting passing shots this good; and they were the best. Annacone used to chip and charge in college and in the 80’s. And by the way he wasn’t very good at it! He trained Sampras in his later years, but maybe this is why Sampras lost to Fed at Wimbledon. And later declined so fast. Yes,but don’t forget Djokovic hit 2 “gambling” shots that hit the corners on Fed’s match points.So I would say fortune favors the brave.And moot point this may be,but Nadal in the Final was just too fresh and confident.So even Fed there would have lost. KF Chan – but there is a time to gamble. For Federer it was at his first of two match points. Yes, Federer may have lost in the final – but is that as bad as losing in the semifinal, and sinking to number 3 in the world, behind Djokovic who is now number 2?